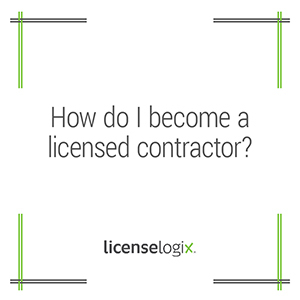 Becoming a licensed contractor can be an overwhelming experience. There are usually a slew of state, county, and city licenses and registrations necessary in order to operate as a compliant contractor. Contractors are often required to take and pass exams, submit fingerprints, pass background checks, demonstrate adequate insurance coverage, and post a bond. Licenselogix can streamline all these requirements and obtain all licenses on your behalf. Most states will require contractors to register with a State Board, pass examinations, and then obtain local business licenses and permits. Some states that license contractors this way are Florida, California, and Nevada. Other states do not license contractors on the state level. For instance, New York contractors must be licensed at the county and/or city level of government. Often contractor licenses are different based on whether the contractor preforms residential or commercial work. Many contractor licenses have additional exam or experience requirements for specialties such as carpentry, framing, painting, concrete, irrigation, etc. Other requirements include forming or foreign qualifying your business entity, registering for state and local taxes, and obtaining basic business licenses. Contractors that plans on having employees will need to register for payroll taxes at the state level. Some states and localities require contractors to obtain basic business licenses, even if they are only entering the jurisdiction to work on one job. Looking to expand your current contracting business? Licenselogix can help you easily and quickly become licensed in multiple municipalities, counties, and states. Want to renew your contractor license? Licenselogix will file renewals, verify that your license is in good standing, and alert you of any discrepancies or holds on your license. LicenseLogix will navigate the maze of state and local licensure for all types contractors, as well as manage all ongoing license renewals. To get a free quote fill out the box on the right, or give us a call at (800) 292-0909.